Both of these features are only present in the “pro” version (you can upgrade with an in-app purchase) on iPhones, iPads or iPod touches running iOS 9.2 or higher. The thumbnails rely on an internal (non-Spotlight) index of all your bookmarks. It may take a while for all of them to be fully indexed if you have a lot. Normally the refresh process takes place after each sync, updating a few bookmarks each time (starting with the newest to the oldest). Websites will need to support the OpenGraph standard for defining thumbnail images for them to appear. This is something that we hope to expand in future versions of Yummy, but this will always be dependent on the pages you bookmark to some extent. 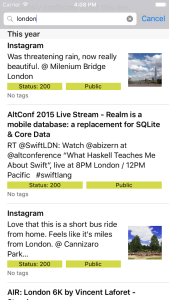 Once a bookmark has been indexed, the thumbnail will automatically appear both in the bookmark view and in Spotlight searches. Over time, the bookmarks that you save become out of date, redirecting away to another page or just pointing to nothing — the famous “404 Not Found” error. Yummy can’t stop that process but it can help you find the affected bookmarks more easily. It relies on the same indexing process used by to find the thumbnails. The HTTP status is shown in the bookmark list view and also in the edit bookmark screen (where it also show the “official” name for the code, in case you can’t remember what, say, a 503 is). You can also filter by status code using the “Filter” menu introduced in Yummy 3.1. It’s split into three categories, broadly everything is okay (200 and above), permission denied (400 and above) and server error (500 and above). If you’re thinking that these are pretty big updates for a point release, you’d be right. These have been ready to go since before iOS 9 launched. 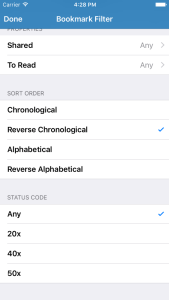 Unfortunately there was a bug in iOS 9 prior to version 9.2 that caused 64-bit iPhones and iPads to restart. (That is, it wasn’t Yummy that crashed but the whole phone. This is called a kernel panic.) We’re really happy to be able to release these new features but sorry it took so long. We hope you like it.